Beverly Hills is one of the best-known enclaves of Los Angeles, mostly due to it be the home and playground of the rich and famous. With affordable rates and premium rental cars, Sixt makes sure you can fit right into the high-end look and lifestyle. Rent a car in Beverly Hills and make your way around this upscale shopping and dining destination in comfort and style. Our extensive fleet offers plenty of options and features models from top brand manufacturers. Choose from our diverse selection of vehicles from luxury brands such as BMW, Mercedes-Benz, Audi and more. Whether you need a car rental in Beverly Hills for a week or a weekend our services can accommodate your mobility needs. We provide a diverse fleet of rental vehicles at our Beverly Hills location, from affordable compact cars and sedans to luxury vehicles and sports cars. As Beverly Hills has a Mediterranean climate throughout much of the year, a convertible might be the perfect choice for soaking up a bit of that Californian sunshine. Those traveling in larger groups can check out our selection of SUVs and minivans, perfect for a weekend away with friends or a family vacation. When you rent a car in Beverly Hills with Sixt you can also customize your experience with useful add-ons. Include a GPS to stay on course or find alternative routes to the busy Los Angeles freeways or tack on additional coverages or protections for more peace of mind. Child seats for babies to small children are also available to facilitate your travels. The weather in this southern California city is mild in the winter giving you a variety of activities to do no matter the season. Temperatures are generally in the upper 60s during the day and the low 50s at night. You can spend your time shopping on Rodeo Drive or simply drive around on Mulholland Drive or elsewhere and see all of the opulent homes. One of those is the Greystone Mansion and Gardens, which you can tour on Saturdays but only by booking far in advance. The Virginia Robinson Gardens are vast and a nice escape from the city. Outdoor activities include going for a walk or hike in Will Rogers Memorial Park or Franklin Canyon Park that also holds the Goldman Nature Center. Holiday events include the Rodeo Drive Holiday Lighting ceremony in mid-November. Rent a luxury sedan or convertible to fit in with the locals! 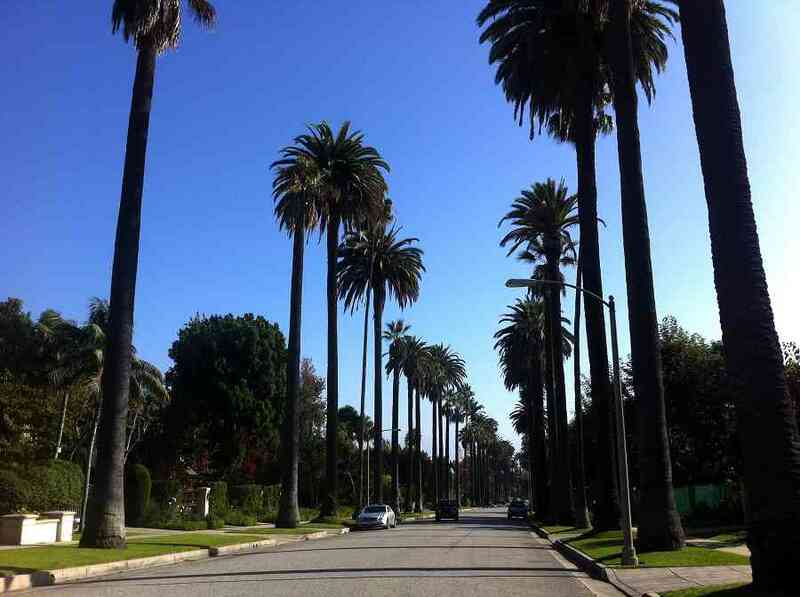 When you rent a car in Beverly Hills, you will be able to explore the city at your own pace and on your own schedule. If arriving into Los Angeles at LAX you can reach Beverly Hills via the 405 North and exit at Santa Monica Boulevard. This main thoroughfare also gives you access to other parts of LA as you can drive Santa Monica Boulevard all the way west to Santa Monica or head east to hip neighborhoods like Silver Lake and Echo Park. You can also use Santa Monica Blvd to link you the main roadways such as the I-405 and Hwy 101. While Beverly Hills is relatively easy to navigate, it's important to know where you can park your car, as parking enforcement in the area is quite strict. Along the street, there are meters that typically cost $1 per hour and downtown there are several public lots that offer free parking for a limited time. However, if you are going out and about for a longer period of time it might be cheaper to leave your car in a parking structure. Beverly Hills is surrounded by some of LA's most beautiful neighborhoods, like Bel Air and West Hollywood. While in Beverly Hills, make sure to take a ride along the famous Rodeo Drive, one of the most luxurious streets in the whole of the United States. Browse the luxury boutiques and pay a visit to the Walk of Style, which commemorates those who have made important contributions to fashion. A place to see and be seen, keep your eyes open as you can surely spot some celebrities while cruising around. Besides driving around to admire the fabulous homes of Beverly Hill you can also visit the iconic Greystone Mansion. Inspired by English gardens, the estate is a vision of Tudor Revival architecture and has been used in numerous Hollywood films.